Multi-national Celtic band Cara are the latest addition to Priddy’s burgeoning 2019 line-up. The band, which encompasses members from Ireland, Scotland and Germany, tour worldwide with unique interpretations of Celtic music, firmly rooted in the Irish and Scottish tradition, presenting innovative arrangements of traditional material alongside original compositions. 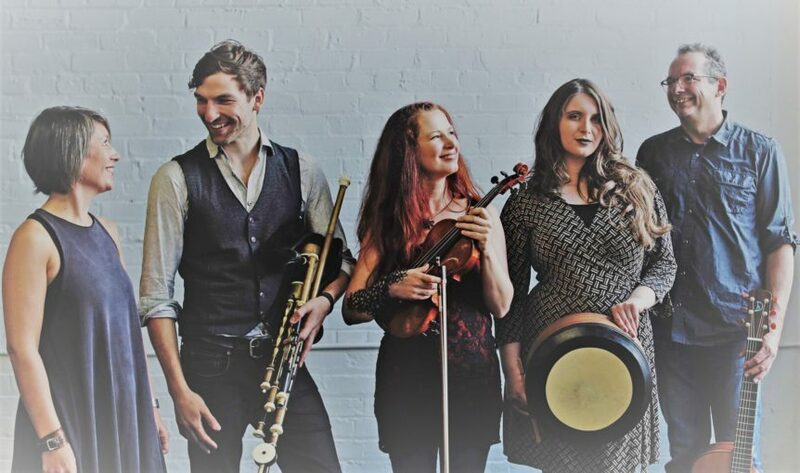 Lead singers Gudrun Walther (fiddle and accordion) and Kim Edgar (piano) are joined by Hendrik Morgenbrodt (uilleann pipes, flutes), Jürgen Treyz (guitars and dobro) and the band’s newest member, world bodhran champion Aimée Farrell Courtney. Together they have headlined some of the largest Irish music festivals and brought audiences to their feet across the USA, Australia, Germany, Ireland, Scotland, England, France, Holland, Belgium, Austria, Switzerland and Denmark. And if you love dancing we have another treat in store with the rejuvenated Random Ceilidh Band. One of the fixtures on the ceilidh scene, the Randoms fell into a slumber a few years back after the departure of a couple of key members. But the band, led by original member Paul Nye, have recruited fresh blood and we are delighted to hail their return to action at this year’s Priddy. You can catch a sneak preview, before their appearance at Priddy Folk Festival, of The Drystones when they appear at The Ritz Cinema Burnham..
Priddy is run by a committee of volunteers. Volunteer stewards are an essential part of the festival. Interested in supporting the festival by stewarding?